So claims Fox19 in a link provided, via Twitter, by ESPNs Dan Rafael. 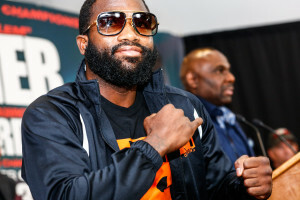 According to the report, Broner has offered up a guilty plea for a disorderly conduct charge that stemmed from some shenanigans at a bar in Kentucky back in 2014. It appears Broner won’t serve jail time for that incident, but that he will instead spend three days in jail for contempt of court. Such things happen when you don’t show up to the courthouse, which Broner is reportedly guilty of. Sadly, this is simply one in a long line of outside the ring incidents which seem to be part and parcel of the talented fighter’s life. Well, he may not be interested in facing Manny Pacquiao without a Fort Knox sized paycheck, but Adrien Broner is going to spend some time behind bars whether he wants to or not. “Hamilton County Common Pleas Judge Robert Ruehlman,” Cincinatti.com reported, “found Broner, 26, in contempt of court” on Tuesday. Indeed, Broner was supposed to show up for court due to a bowling alley incident last winter. And while he certainly showed up, Broner showed up later than he was supposed to – late enough to find himself thrown in the clink. “Somebody put something in my drink,” Broner told Ruehlman. Needless to say, Ruehlman wasn’t buying it. “To coin a little boxing phrase,” the judge said, “you’re not ducking this one.” The irony to all this, is that Ruehlman reportedly might have dismissed the charges against Broner during the hearing. Yet things simply didn’t work out that way – because Broner couldn’t, or wouldn’t, get to the court on time. Sure enough, Broner is said to have not looked his best on Tuesday. “He looks like he’s drunk or hungover,” Ruehlman stated. Clearly, “drunk or hungover” is not the impression one wants to leave when standing before a judge. Yet Tuesday was, ultimately, just one in a long line of notable days for the Ohio native. For Broner is now known almost as much for unsavory behavior as he is for his considerable ring skill set, a skill set which has won the man numerous titles in a record that currently stands at 32-2. For over the past few years, Broner has humped an opponent in the ring, reportedly flushed what appeared to be money down a public toilet and has been rather familiar with law enforcement – though not in a good way. Some fighters have big mouths – Broner is known to take things a bit further. The question now is, as it’s been for a while, will Broner be a successful fighter or will he ultimately end up being a disappointment? People are interested in the man, but how long will people take him seriously as a fighter if he doesn’t show he still “has it” as a boxer? Even more importantly, how long will Broner be able to be to keep his head above the very rough water he seems to love to swim in? This is no longer about boxing. This is about a life that may well be out of control.